The all-new 2015 Mercedes-Benz makes its global premier at the 2013Frankfurt Auto Show and it’s possibly the sportiest SUV in the world. 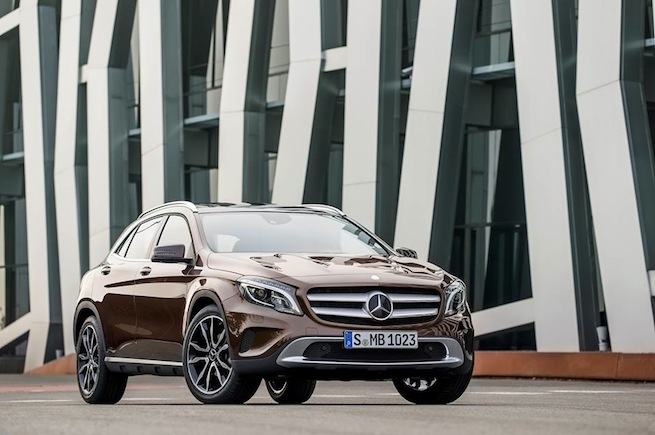 The new 2015 Mercedes-Benz GLA is the first Mercedes compact SUV and quite possibly it’s the sportiest compact SUV on the planet. We’ve been covering the new Mercedes GLA and believe it will be a big hit for the German automaker. It’s the right size at the right time as a new generation of buyers are looking for a premium compact SUV. Mercedes hit all the right areas with the GLA. It features a new progressive design, functional for everyday use, with an eye towards recreation on the weekends with all-wheel-drive. Mercedes enters the growing premium compact car market with the new GLA and it will be the fourth of five new compact models from Mercedes-Benz. It will compete with the BMW X1, Audi Q3 and Range Rover Evoque. It will come with a host of new engines for the global market. It will feature gas engines with 1.6 and 2.0 liters of displacement and extends initially from 115 kW (156 hp) in the GLA 200 to 155 kW (211 hp) in the GLA 250. In addition, buyers can chose two diesel variants, the GLA 200 CDI with 100 kW (136 hp) with a maximum torque of 300 Nm, and the GLA 220 CDI with 125 kW (170 hp) and 350 Nm. The all-new 2015 Mercedes-Benz GLA can be ordered at the end of November in Europe and will reach U.S. shores next fall.